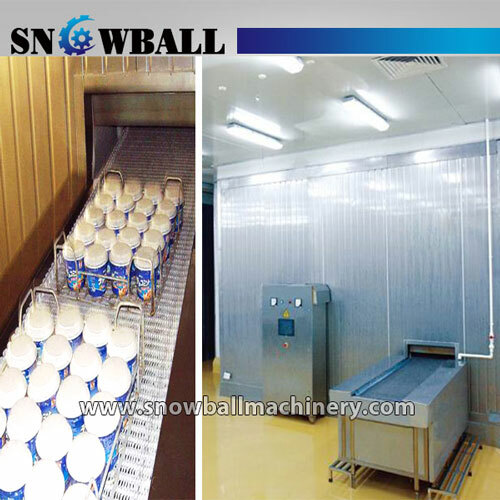 Quick freezing tunnel is a complete line for freeze cup, cone, family size container ice cream, also for other foods, like shrimp, chicken, meat an-d etc. Freeze tunnel machinery can be divided into four categories: Blast Quick Freeze tunnel , Contact Quick Freeze tunnel , Cryogenic Quick Freeze tunnel , Liquid Immersion Quick Freeze tunnel . The machine has reached the internationally advanced technology level, adopting complete pneumatic working, Siemens (PLC) display all operation data in the screen . The cold medium supply of machine adopts double-in, single-out method to increase the flow speed, an-d the speed of heat an-d cold exchange. It decreases the production consumption, greatly increase the production ability, an-d lowers the productions cost . thus making manufacturing satisfied an-d become the first s-election of ice cream production companies both at home & abroad. 2. Easy cleaning an-d operation. 3. Sprial type an-d belt type, customized tunnel avaliable.